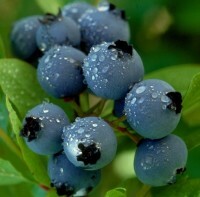 ​​​The most widely planted blueberries, popular with home gardeners throughout the northern U.S. and southern Canada. 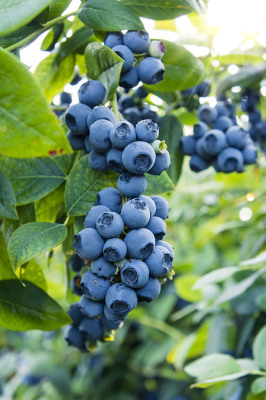 There are over 100 named varieties of Northern Highbush Blueberries. We have selected 5 of the best that offer gardeners delicious crops continuously over a 100 day period. These varieties display bush shapes from short and compact to tall and open. 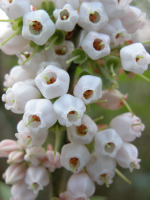 The berries range in size from ¼" to over 1" in diameter and almost black to light powder blue. Northern Highbush require approximately 700 chilling hours for proper dormancy. All cultivars are self-pollinating but will produce better crops if more than 1 variety is planted ​(image). Bluecrop - Mid-season. Considered the best all around variety for consistent yields, large high quality fruit, and disease resistant. 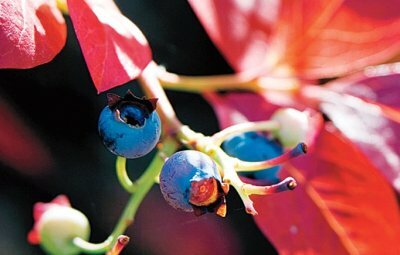 Bluecrop is an upright, open growing bush to 4'-6'. There are other varieties with better ornamental value but none better in the garden. The leading commercial variety in North America. Earliblue - Very earl, first to ripen. Large, light blue, delicious sweet flavored berries. The upright bush produces stout canes with bright red wood and large glossy green leaves. 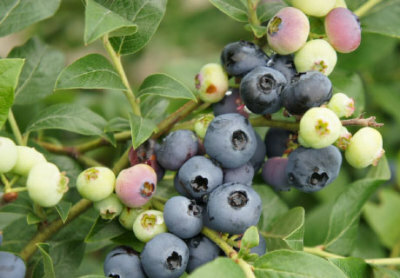 Plant where blueberries are well suited and avoid frost pockets ​(image)​. 800 hours below 45 F (image)​​. higher yielding cold hardy variety. Northcountry - Early to mid-season. Northcountry grows slightly larger than Northsky, reaching 1½'-2' high and 3½' in diameter. It has similar bush characteristics to Northsky, with dark green foliage and compact growth, but is more vigorous and adaptable in less than optimum soil types. Fall foliage is scarlet-red. 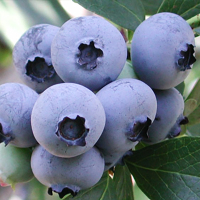 The fruit of Northcountry is medium size, about ½" in diameter with an appealing sweet, "wild" blueberry flavor. Yields will range between 2-5 pounds per mature bush. 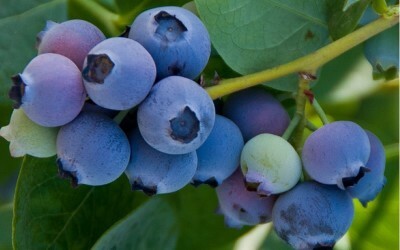 Northcountry is one of the best varieties for the edible landscape (image). Northsky - Midseason. 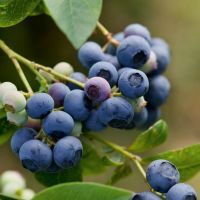 With its release by the University of Minnesota in the early 1980's, Northsky brought blueberry growing to many areas previously thought too cold. It is the most cold hardy of all blueberries surviving winter temperatures of -45 F. Will be most productive with adequate winter snow cover. Even in warmer areas Northsky has been quite popular as a wonderful addition to the landscape. The bush grows to a low compact mound about 12"-18" tall and 2'-3' wide. Completely covered in snow white blooms in spring. The foliage is dense, with small glossy green leaves in summer and brilliant red fall color. The berries are small with a dusty bloom that gives them a beautiful sky blue color. Flavor is similar to wild blueberries. Yields range from 1 to 2 pounds per bush. Northsky is particularly well suited for container growing, borders, or group plantings in the landscape. Self-pollinating ​(image). An entirely new type of hybrid utilizing the Northern Highbush, Rabbiteye Blueberry, and wild selections from the Appalachian mountains. The intent was to combine the fruit quality of Northern Highbush, the low winter chilling requirements of Rabbiteyes, and the soil adaptability and drought tolerance of the wild types. We have been very impressed with the results and feel these varieties will be the wave of the future for southern gardeners. All Southern Highbush are self-pollinating but the berries will be larger if 2 varieties are planted together. These varieties have low winter chilling requirements. Chilling hours are an accumulation of hours with temperatures below 45 F in the dormant season. The chilling hours required are listed for each variety ​(image). minimum of 150 chilling hours. which is zone 10 (image).